A full arch denture is a removable tooth replacement option for those who need all their teeth replaced. They can be crafted to provide the characteristics (tooth shape and color) the patient desires. Advances have been made in the materials used for dentures and in the way they are designed. If you already have dentures (partial or full arch) you may be experiencing a loose fit or denture slipping. This can lead to gum sores, can affect your chewing and your speech, and decrease your confidence when speaking and/or laughing with others. We can help restore your dentures to the correct fit. An immediate denture is a complete denture or partial denture inserted on the same day, immediately following the removal of natural teeth. Constructing immediate dentures involves taking impressions of your mouth before the teeth are removed. When your remaining teeth are removed the denture can be inserted immediately over the new extraction sites. The mouth will change after it heals, therefore, your dentures will need to be evaluated at intervals and relined to fit the changes that have occurred in your mouth. Even a single healthy tooth left in place can add to the stability of the denture by a significant degree. The Cusil denture has holes for natural teeth to come through. These holes are surrounded by silicone rubber which hugs the natural teeth and allows the rest of the denture to rest on the gums. 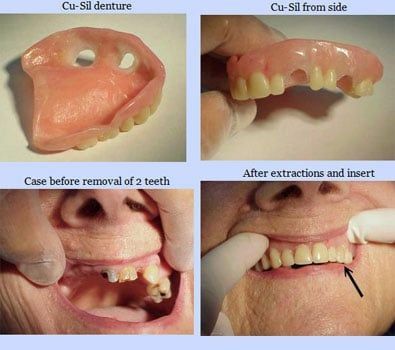 Cusil dentures thus help stabilize loose teeth and extend the life of the teeth.